First, let’s define a bubble. A bubble is a period of overinvestment where asset prices aren’t aligned with reality. In other words, people are betting on a future that won’t exist. Sadly, too many Americans now understand this all too clearly, having invested in a housing market that they assumed could only go up. What evidence is there that craft is in a similar situation; that brewers and investors are betting more than they should on a future that won’t exist? The comparison is striking. 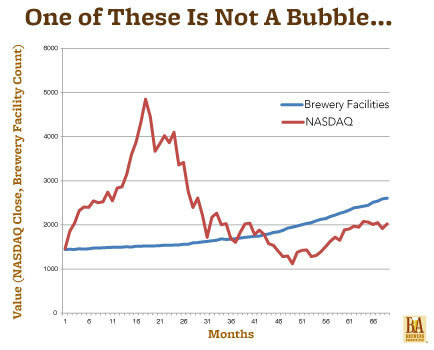 Suddenly, the current rise in the number of breweries looks slow and steady (for the record, the NASDAQ is now back up to over 3,700). It is much more relevant to talk about capacity and/or market share. If craft is in a bubble, it is because more is being invested in capacity than the market can bear. So what’s the evidence? The BA has two recent data points about capacity. In 2009, production was at 66% of capacity. In 2011, it was 78%. If anything, this means there should be less fear of a bubble than in the late 2000’s. Now, a lot has happened since 2011. New breweries were added at a rate of one a day in 2012, a shocking rate (409 opened versus 43 closings, for 366 total – good thing it was a leap year). 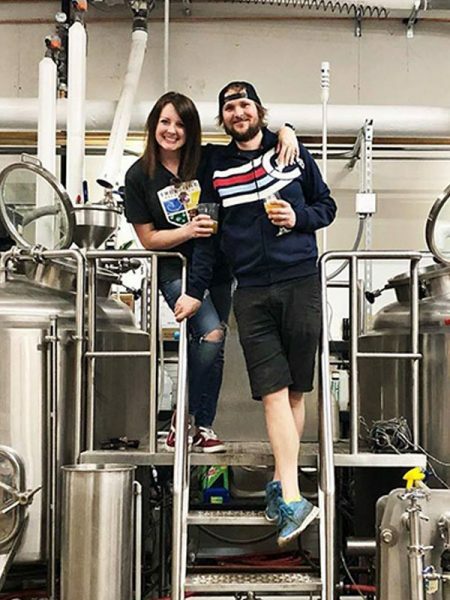 Nevertheless, many of these breweries are small and local, and many medium and large breweries continue to report that their capacity can’t keep up with demand. The 2013 capacity/production numbers, which will be reported next year, will tell more, but at the moment, it doesn’t appear that craft is overinvesting in capacity. That leads us to market share. How long can craft keep gobbling up share points at the rate of 1 or 2 points a year? The answer: as long as the consumer demand for full-flavored beer continues, and it shows no signs of slowing. The craft revolution isn’t just built on innovative businesses, it stems primarily from a changing set of consumer preferences away from light adjunct lagers and toward full-flavored beers for more occasions. Some of this demand is being met by new brands from large brewers, but market statistics continue to show that the vast majority is being met by local craft brewers. Where will it end? Consider the following thought experiment. In 2012, there are roughly 148.3 million 21+ Americans who drink alcohol (39% of whom prefer beer!, Source: Gallup 2012). Those drinkers consume a lot of beer. The American beer market totaled more than 200 million barrels in 2012, or about 66 billion 12-ounce servings. That’s about 1.2 beers a day for each 21+ drinker. Now if each one of those drinkers enjoys one more craft beer a month, craft’s market share would increase by 2.7% (9.2% total). If each of those drinkers has one more craft beer a week, that’s another 11.7% in market share (18.2% total). I’ll stop the extrapolation there, but hopefully you get the point. Even small changes in consumer behavior can dramatically re-shape the landscape of the American beer market in a short time period. Furthermore, there’s plenty of evidence that the changes outlined above are imminently attainable. 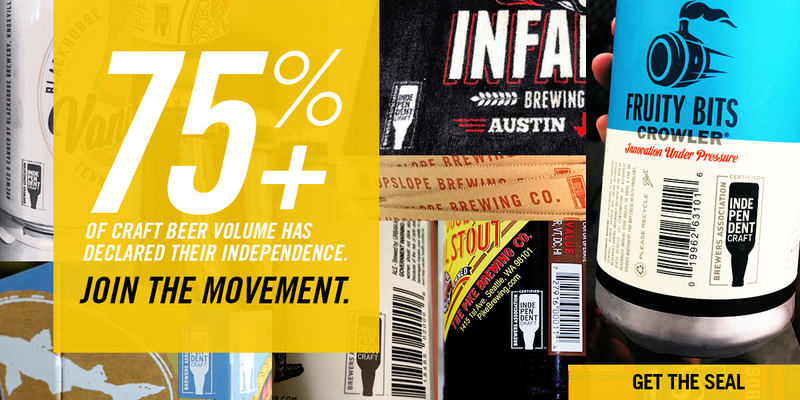 Craft’s market share is strongest amongst the youngest generations, it is driven by 2,500 innovating brewers attuned to local markets, and together these consumers and producers are helping shift American beer culture. We see this in the fact that markets with the strongest craft presence continue to grow. Oregon, one of the most mature craft markets in the country, still saw production volume grow by 11% in 2012. Now none of this should be taken to mean that double-digit production growth is assured. For one, as mentioned above, all of this assumes that quality remains high. Brewers that enter a more crowded market without high quality beers that differentiate them from the field will soon discover the harsh realities of the sector: increasingly crowded shelf-space, existing competitors with greater access to capital and/or technical knowledge, and global players that are increasingly carrying full-flavored, locally-targeted brands of their own. None of these caveats, however, makes a bubble. Shelf-space can be expanded and distribution channels widened. There is evidence that this is already occurring. Nielsen found that the number of opportunities to sell beer has increased 2.5% since 2008. More impressively, the NBWA found that between 2007 and 2011, the number of average SKUs handled by distributors increased from 262 to 536. In addition, retailers that fail to keep up with consumer demand in the beer sector will also learn harsh realities about market competition. Retailers who hold shelf-space for brands with flat growth while passing up a sector that is growing by double-digits annually will find themselves rapidly losing ground to competitors. Additionally, the fact that global players are diversifying into their own full-flavored product lines and investing in or buying up regional brewers proves the solidity of the consumer base on which craft sits. Finally, it is worth noting that as craft develops further, a more mature market means that volume growth will inevitably slow and some entrants will fail. But, slowing growth or a rising rate of closings doesn’t mean a bubble has burst. 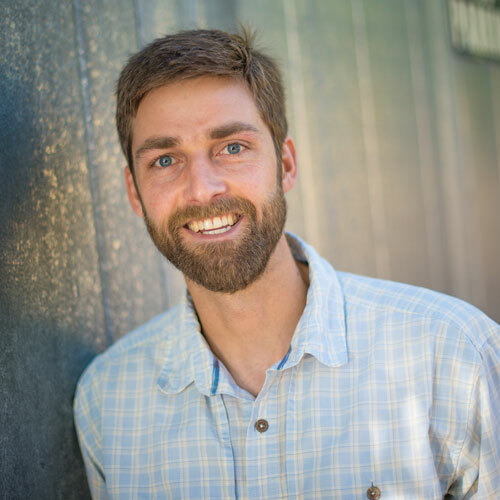 At a certain point, a growing base means that 10 or 15% volume growth becomes more and more difficult, as the same percentage rate requires a greater growth in barrels produced every year. Similarly, a slowing rate of openings or increased closings should not be taken as a sign that the craft market is collapsing. Think again about restaurants, how many close every year – does that mean we are in a restaurant bubble? Although it is likely craft will reach a point (hopefully many years) down the road where volume percentage growth slows and closings equal openings, this is a sign of a mature marketplace rather than a bubble. 1To enhance the visual comparison, points are taken from the 7th of the month (or closest day) in order for the starting points to line up. Monthly averages produce a similar picture.